The yearly protest has a history of vandalism and mass arrests, with 258 people arrested in 2011, and similar numbers seen in the years that followed. Protesters began to congregate at 5 p.m at Parc Lafontaine, where a barbeque was held, and people took turns hitting a pig piñata dressed as an Service de police de la Ville de Montréal officer. Around 300 demonstrators launched from the corner of Rachel and Garnier Sts. at 8 p.m to the sound of a looming helicopter overhead. 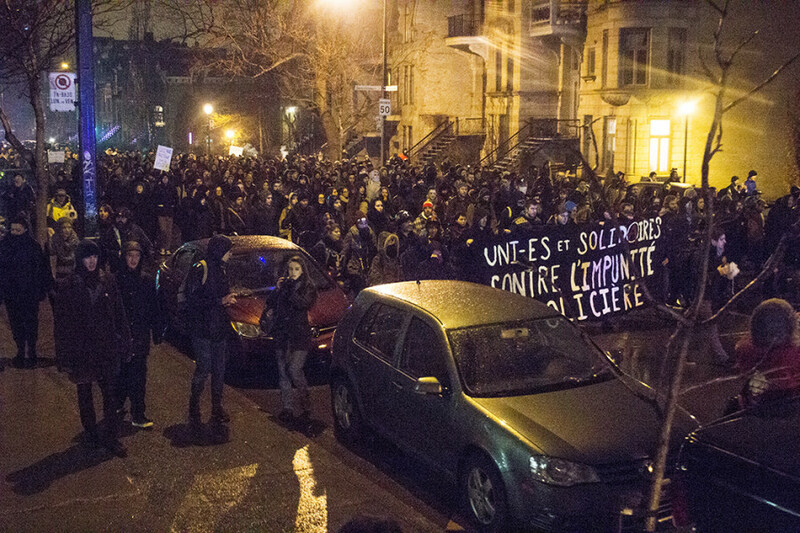 The usual chants of “À qui la rue, À nous la rue” began to fill the streets, with police cruisers heading the crowd and some side streets blocked by officers. 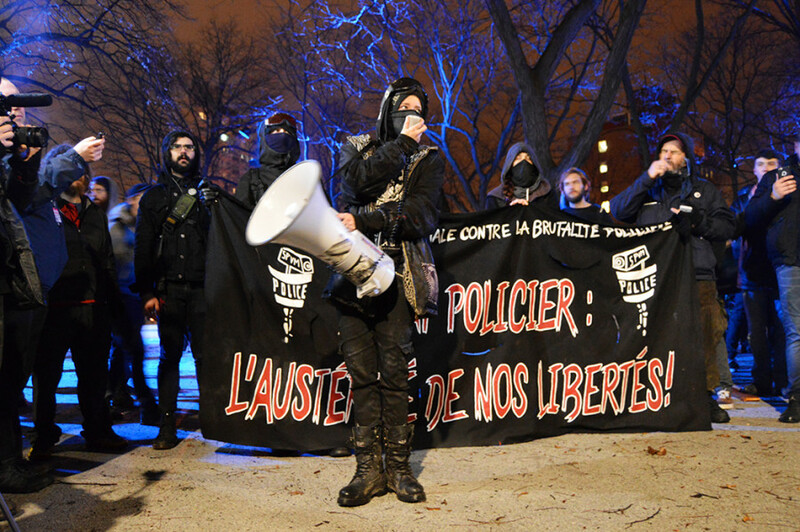 Prior to the launch, speeches were given in both French and English decrying police violence, and commemorating those who have been killed by officers. Seasoned activist Wendy Stevenson, 69, who had participated in anti-Vietnam war protests in her youth, had never seen police aggression until the Maple Spring of 2012. “I had never seen them just plow into a crowd of young people, who were just asking for some things like free education and no increases in their tuition fees,” she said. She recalled a personal experience with police violence, when she was shoved for trying to help a man who was being “manhandled” by an officer. “They were really nasty. They pushed us—I’m an old lady, but that didn’t matter,” she said. According to Stevenson, a lot of people are afraid to demonstrate for fear of being fined, or getting kettled. However, this time around, nothing of the sort transpired. Richard Beaulieu, who has marched in the anti-police brutality demonstration five times before, suspects that the peaceful nature of the march might have had to do with the bad publicity the SPVM received after the undercover cop incident. He recalled previous years where protesters were arrested in conjunction with the controversial bylaw P-6. “None of this was happening [tonight],” he said. Nick Harvest, member of the Industrial Workers of the World, believes that the issue is about police violence and a lack of accountability, regardless of how tonight’s protest unfolded. The protesters marched down various downtown streets, like Ste. Catherine and St. Denis. The demonstration concluded at around 9:30 p.m in front of Atwater metro.